A leaking roof can cause damage ceilings, walls, insulation, carpets and electrical goods. 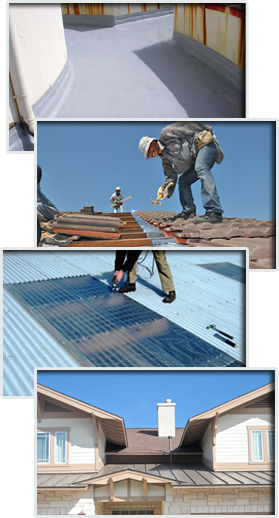 Our team of professionals will identify and eliminate roof leaks until the problem is solved. You need to feel like your home is safe and secure, by making sure that your home is water tight. At K.K.ROOFING CONTRACTORS PTE. LTD. we will discuss with you any of the main issues that you may have been incurring with your roof so that we can get the best possible solution for your property. Housing is one area where changing the roof can dramatically improve the appearance of a building (as the roof generally makes up a significant portion of the outside structure). Our qualified team of roof and waterproof specialists take great pride in their work, always completing a job to the customer’s satisfaction. Replacement of cracked roof tiles. Sealing of vertical lapping joints. Waterproofing of gutters and roof ridges. Sealing up of lapping joints with waterproofing membrane. Waterproofing of gutter and flashings. Re-caulking of sealants and replacement of roof fasteners. Re-coating of entire metal roof. Due to our hot climate, concrete flat roof left without proper waterproofing may result in cracks. It is therefore important to protect it with a good quality water-proofing system. We provide 2 types of waterproofing services. We supply and install a wide range of metal roof. With energy efficient architectural designs more and more in demand, metal roofs are becoming popular again. A metal roof can be very energy efficient. When treated with a reflecting coating it can provide a significant reduction in cooling costs. Metal roof can last for a few decades. We install metal roofs of good quality. New Clay has been used as a roofing material since before the dawn of civilization. The clay products commonly found at archeological sites can be thousands of years old, and are a testament to the durability and long life of clay–two excellent qualities in a roofing material. Because clay tiles come in many different shapes, sizes, colours and styles you are likely to find a tile that suits your structure perfectly. We have workers with good experience in internal and external painting work. Our team of specialist painters will pressure-wash all surfaces to be painted, repair all cracks with approved patching compound and then paint with good quality paint. If you’re looking to replace your guttering system, the big question is what type of gutters are the best? Let’s look at the various types you have to choose from. If you are looking for strength a steel guttering system is your choice here. Steel holds up to the elements better than any other type of gutters. They will basically last forever. The durability and visual appeal make copper gutters an excellent choice for your home. They are easy to maintain and hold up to rain water very well. The major drawback with copper is that it can discolor over the years. What starts out as shiny and gold can turn to dark brown or green over time due to oxidation. With that said, there are sealants you can to help prevent this from happening. The selling points with aluminum guttering is their light weight and affordability. They are the most economical rain gutter option. Aluminum is not as strong as steel or copper, but they still hold up well to the different weather elements. Vinyl gutters provide you with a system that is lightweight and virtually free. They also give you a variety of colours to choose from that other gutters do not. The drawbacks to them are their lack of strength and the fact they are subject to the effects of hot or cold weather.